31st Union showcases flavors from the Golden State. With the bounty of fresh and wonderful produce available around these parts, it's not unusual for Bay Area restaurants to brim with local pride. But the concept has been increasingly celebrated for the past few years in particular with the opening of restaurants such as Radius and Local's Corner that assert locavorism from their names on down as well as high-profile debuts such as Central Kitchen that are consciously working toward a new and refined definition of Northern California cuisine. 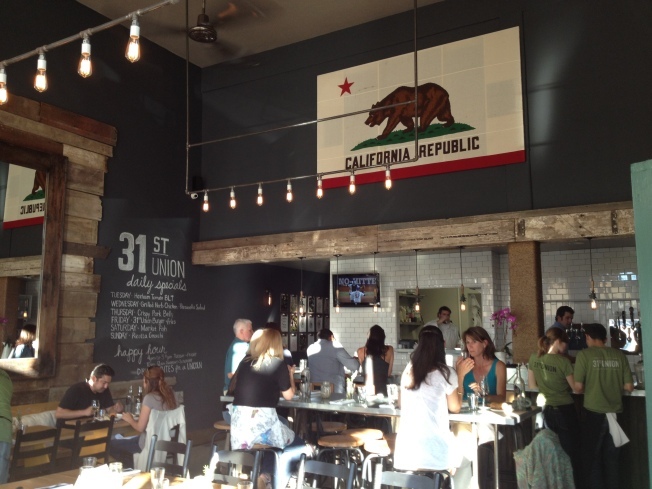 San Mateo's 31st Union, which opened in June, is the latest example of this prideful trend, with all main ingredients coming from the whole state of California. A Golden State flag and state map indicating the restaurant's main food purveyors are prominent design features of the 50-seat restaurant, which also sports quirkily framed art and walls made from a reclaimed barn. The large-ceilinged room that is conducive to a social atmosphere. The menu is largely comprised of snacks and small plates ($4-$15), with daily entree specials. It's possible to stop in for a local beer or wine and graze on a cheese or charcuterie plate, or fill up on something more substantial, like fish & chips, smoked duck tacos, or grilled hangar steak. While the inclusion of the gratis Hetch Hetchy tap water on the menu might be taking the local thing a little bit too far (especially when a lot of the purveyors are left a mystery on the menu), 31st Union is a lively new choice and opportunity for a city best known for its ethnic food restaurants. It's a place that plans to contribute to the culinary conversation on what it means to cook in California.